The sheefish (Stendous leucichthys nelma (Pallas)) called inconnu (unknown fish) by early explorers, is found only in arctic and subarctic North America and Asia. In Alaska, it is most abundant in the Kuskokwim and Yukon river drainages and in the Selawik and Kobuk drainages of Kotzebue Sound. Its tremendous size, fighting ability, and fine eating qualities make the sheefish one of the most unique fish in North America. The sheefish is a member of the whitefish family but is distinguishable from the more common whitefish by the strong extended lower jaw. The body profile is streamlined and the color is silvery with a darker coloration on the dorsal surface. It often displays a phosphorescent purple sheen when taken from the water. Males and females are similar, but females live longer and attain greater size. Sheefish in some coastal areas may weigh up to 60 pounds, while in Interior Alaska they seldom exceed 25 pounds. In past years, the major use of the sheefish has been as a subsistence food for Alaska Natives and their dogs. However, its popularity as a sport fish is continually increasing. Sheefish taken on summer feeding grounds such as Minto Flats, the Holitna River, or the Selawik-Kobuk areas put up the best fight. Royal Coachman Lodge fishes the _____ river and although sheefish have not usually targeted, we are hoping to learn more about this rare fish. With the right guests, we’d love to try some exploratory fishing for sheefish. Although we do not focus on them we certainly focus on them when they are in the area. We catch a few each year and they average 8-10lbs! They take the fly very well. Want to catch a Sheefish? 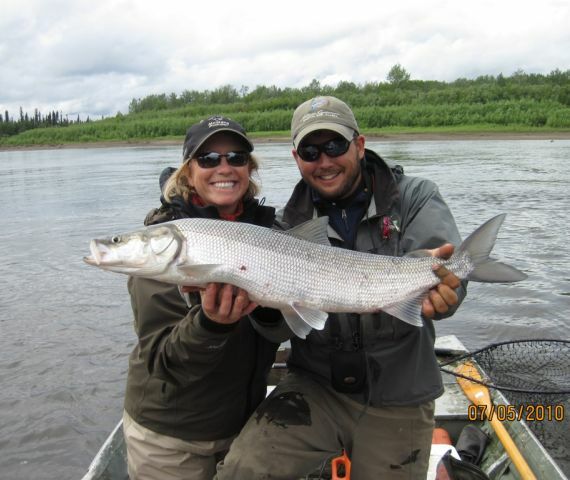 Visit our Alaska fishing lodge in June and early July and we will get you one!